Nooo stop Blizzard with those powercreep!!! Poor Chillwind Yeti!! First this, then Leyline Manipulator. Just stop!! I wonder how useful this is in today's meta? Well that took a while to be used in something else than Warlock. This card is good for a silence deck--Priest, namely, since you can drop 0 cost silences for a turn 2 4/5. 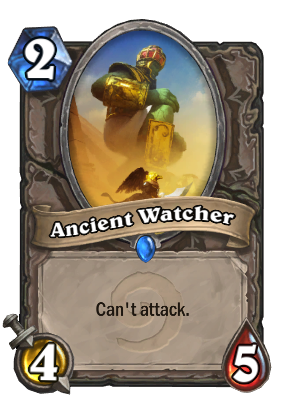 Ancient Watcher works if your deck has -too many silences- because that surplus turns into one beefy early game card. Whoever is in possession of it cannot attack with it. It can be attacked, however. i'm starting to like this guys more ever since i built my handlock and watchers decks !!! Is this card actually useful? Maybe used i conjunction with a self-silence? It can certainly be useful. If you either manage, as you've said, to self-silence it or, alternatively, place a taunt on it, the opponent is then forced to deal with it. Combine adding taunt with buffing it up and you can really annoy the opponent!